Many people might think that gold investment is only possible for the rich investment professionals or people who have mountains of dollars lying around. What you might not know is that gold investment can also be profitable for the average normal person like you and me. After speaking with a lot of friends I have found that one of the biggest deterrents for the average Joe to investing and buying gold is simply ignorance of the possible ways one can invest in gold. Buying gold coins or bars is the best way for a beginner to start. However, if you are just getting started in understanding how to invest in gold be sure to avoid purchasing rare gold coins. They are very beautiful but if you are not experienced in identifying different types of coins you can lose a lot of money. Also be sure to avoid internet auction sites like Ebay for your gold purchases – it is really easy to fall victim for fraud. A great place to buy gold from is your local goldsmith. Goldsmiths usually give you a reasonable price and they are also handy at recommending different types of gold for investment. Buying physical gold might not be for you if you don’t have a safe place to store it. Keeping a lot of gold in your apartment is not a a good idea if you live in a shady neighborhood. Buying gold mutual funds is a great option for someone who wants to purchase gold in a safe way but who isn’t interested in taking care of the physical gold. Ask your local financial expert and he will probably set you up with several gold mutual funds. Another option for those who are interested in gold but uneasy about the prospect of physical possession or storage is buying gold futures. When you purchase gold futures you are essentially buying a contract to buy a specific amount of gold on a specific date. It may not be as good an option for beginners as mutual funds are but if you are willing to take the speculative risk, it could pay off. 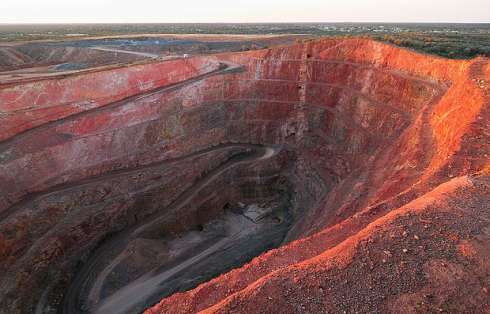 The New Cobar Gold Mine in Cobar, Australia. Yes, it is huge! Purchasing gold mining stocks is similar to buying gold mutual funds or futures. You don’t actually purchase physical gold and you don’t have to be concerned with any storage. Stocks of gold mining companies are just what you would think, stock in companies that mine gold. You purchase stock in gold mining companies in the same way that you would buy stock in any publicly traded company. This can be difficult for beginners who have never traded on the stock market since the prices of stocks can vary strongly throughout any given day. Gold prices have increased more than 7 times during the last 10 years. 500 dollars spent on gold in the year 2000 is worth almost $4000 today! If you think that gold prices keep increasing at the same rate in the future it is definitely a great idea to start investing! hi, i recently visited your site from the google search result. I felt very impressive with your blog post and your blog apperance is extremely good… thank you for your wonderful work…keep it up..
An Investment in Gold is a Good Inflation Investment ONLY if the Return on your Investment is higher than the Inflation in the same period of time. If you invest in Gold and lose 20% of your money in a year and that year the inflation in your country was 2% then your investment in gold was not a good inflation investment.Thanks for sharing the information. Inflation is an increase in the general level of prices of a given kind in a given currency. Inflation is measured by taking a “basket” of goods, and comparing the prices at two intervals, and adjusting for changes in the intrinsic basket. Gold is not a currency anymore and the Gold Standard is no longer used in any nation, having been replaced completely by fiat currency.Thanks for sharing the information. If owning gold is good enough wealth insurance for the greatest nation on earth as a guarantor of paper assets, shouldn’t it also be good enough for all of it’s citizens? Committing directly in merchandise, such as gold or oil, tends to be more challenging for traders than getting ties and shares. A primary reason for this is that ties and shares are easily transferable and easily accessible to the average buyer.